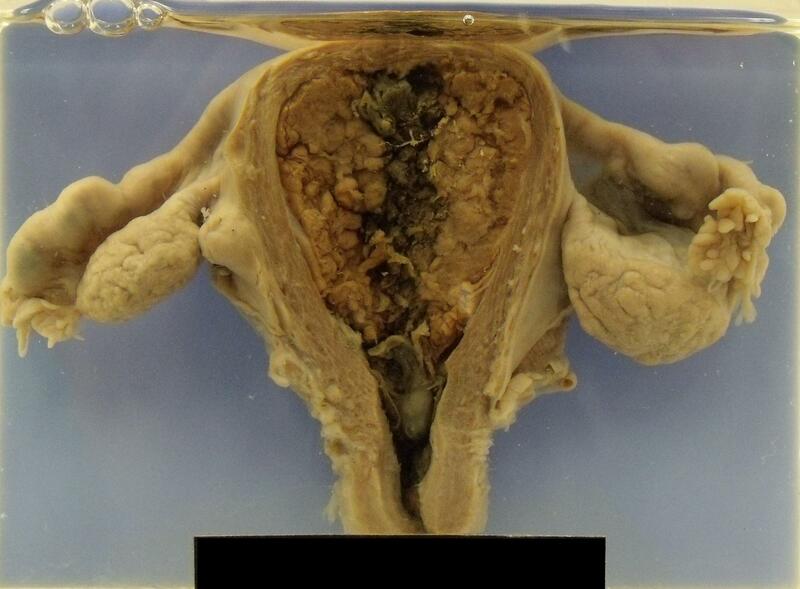 Endometrial carcinoma is a malignant tumour of the endometrium. The incidence is around 13 per 100,000 per year. The tumour tends to present in postmenopausal women, although approximately 20% of cases occur in premenopausal women. The peak incidence is around 60 years. The classical cohort of risk factors includes obesity, diabetes and hypertension, nulliparity and a late menopause. These risk factors centre around increased levels of oestrogen and/or prolonged oestrogenic stimulation of the endometrium. However, there is also a subset of tumours that tends not to be associated with these typical risk factors and which presents at a later age. The tumour may be an exophytic nodule or a sessile plaque. Ulceration can be present. The more nodular tumours can fill and expand the endometrial cavity. Although the tumour invades the myometrium early, the myometrium can slow the advance of the tumour and delay more extensive local invasion. When local invasion does occur in involves the parametrial tissues, the peritoneum and later the pelvic organs. 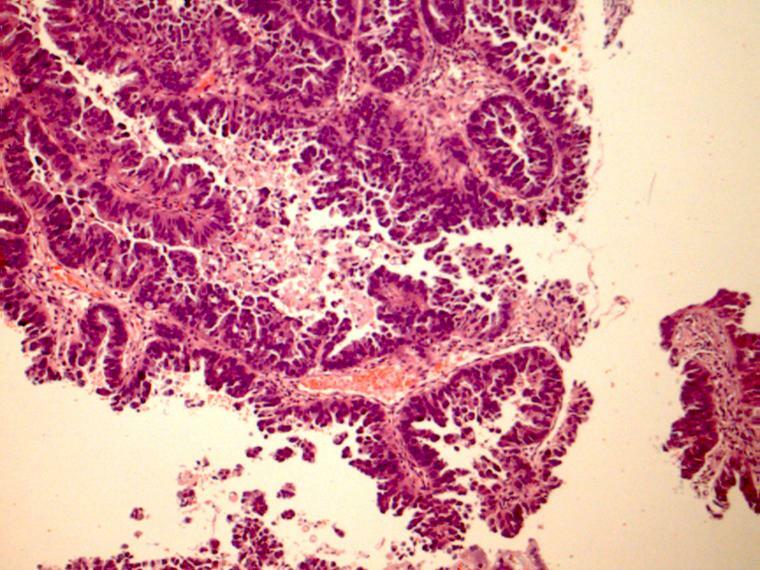 The carcinoma can also extend along the fallopian tubes and also reach the ovaries. Metastases are to the peritoneum, mesentery and the aortic and iliac lymph nodes. Later metastases involve the liver and lungs. The majority of endometrial carcinomas are endometrioid adenocarcinomas. These are adenocarciomas which resemble the glands of the endometrium. The grading system of endometrioid endometrial adenocarcinomas is determined by the proportion of nonsquamous solid components in the tumour. A grade one carcinomas has no more than 5% solid components; a grade two tumour possesses 6-50% and a grade three tumour demonstrates more than 50% solid components. The grade derived from the architecture can be raised by one step if the cytological features are disproportionately severe to the architectural grade. Serous carcinoma is sometimes known as papillary serous carcinoma and is a high grade tumour. Although the tumour often forms papillae this pattern of growth is not compulsory and hence the term serous carcinoma is preferred. The constituent cells are cuboidal or hobnail. 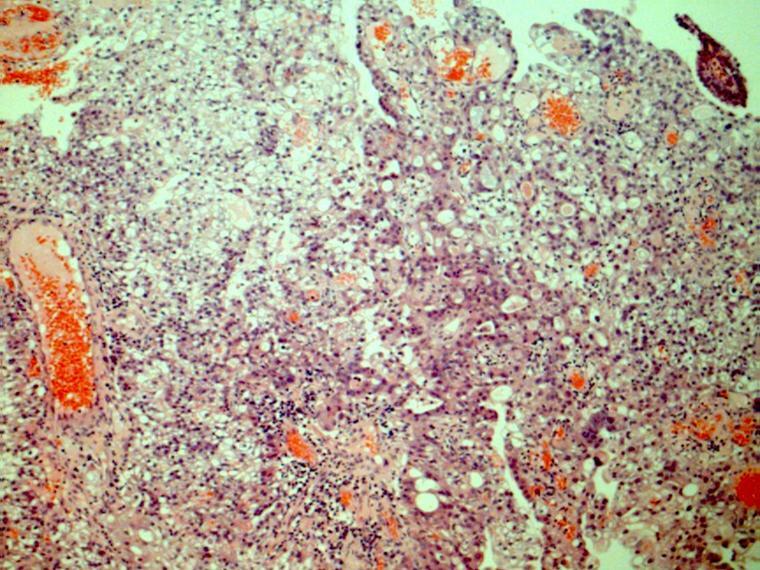 Although the carcinoma often does not seem to invade deeply into the myometrium it is has nevertheless frequently spread beyond the uterus at presentation and is therefore typically high stage. Clear cell carcinoma can have solid, papillary, tubular or cribriform patterns of growth and is composed of not only clear cells but also cells that have eosinophilic cytoplasm. Some of the cells possess a hobnail appearance. Like serous carcinoma it is a high grade tumour. The malignant mixed Mullerian tumour (MMMT) is also known as a carcinosarcoma. It is composed of both (adeno)carcinomatous and sarcomatous elements. The sarcomatous elements can be either homologous to the uterus (for example smooth muscle) and/or heterogenous (such as bone or cartilage). The tumour is high grade. If metastatic disease is present it is usually derived from the carcinomatous element. 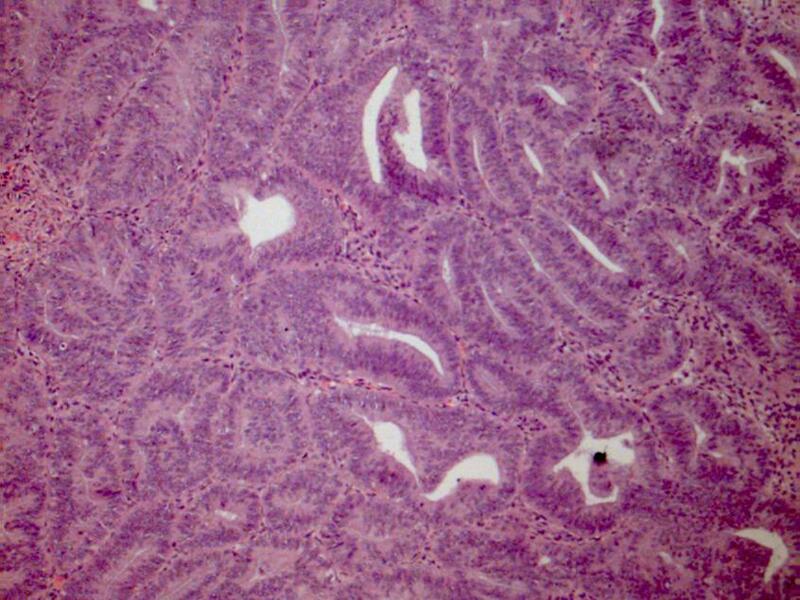 A few other microscopic types of endometrial carcinomas exist and include ciliated, secretory, mucinous and villoglandular. The ciliated variety is unusual in that most adenocarciomas, even if they are derived from cells that are ciliated under normal circumstances, do not retain their cilia. Tumours of the uterus are staged by the TNM and FIGO systems. The FIGO staging system allocates specific patterns of the TNM system to numerical stages. The surgical specimen for endometrial carcinoma will be a total abdominal hysterectomy and bilateral salpingo-oophorectomy. The background aspects of the specimen are as for the general cut up of a uterus. Particular attention must be paid to the ovaries, fallopian tubes and parametrial tissue in the description. The tumour should be measured in three dimensions and its position in the uterus noted. The macroscopic depth of invasion must be recorded, as should the total thickness of the myometrium at this point. The blocks of the tumour should allow the extent of the invasion into the myometrium to be measured and also demonstrate whether or not the tumour reaches the serosa or invades the parametrial soft tissue. The sampling of the cervix may need to be more thorough than the standard two slice approach. Consideration should be given to embedding the entire ovary and fallopian tube. In a post menopausal uterus both of these structures are likely to be fairly small and so can be embedded in their entirety in a small number of blocks. The lymph nodes will be supplied in separate pots. The typical presentation of a uterine carcinoma is with postmenopausal bleeding; premenopausual women may have intermenstrual bleeding. Pelvic pain or back pain can be encountered. The basic principles of the investigation of a tumour apply. The histological diagnosis is usually obtained in endometrial curettings; in some patients a pipelle biopsy may obviate the need for the full dilatation and curettage procedure. The mainstay of treatment is surgery in the form of a total abdominal hysterectomy and bilateral salpingo-oophorectomy. The pelvic and para-aortic lymph nodes are often removed. Supplementary treatment with radiotherapy and/or chemotherapy may be required in higher stage disease or in low stage disease that has features which make recurrence more likely. The five year survival for stage IA disease is around 90%. That for stage IVB disease is in the region of 10-15%. However, the majority of endometrial carcinomas are low grade endometrioid adenocarcinomas that present at an early stage so the survival for endometrial carcinoma as a whole is around 60%.